1. Arrowhead Builders, a Native American-owned GC, recently broke ground in Scottsdale on the 43-acre Sierra Bloom Wellness Campus with plans next year to break ground on a 119-room Holiday Inn. Sierra Bloom Wellness Campus will be built on Salt River Pima-Maricopa Indian Community land at the Loop 101 and 90th Street in North Scottsdale. The project comprises two phases of full site development. 3. Able Aerospace Services, a Textron Aviation Inc. company, recently held a groundbreaking with dignitaries from the East Valley, Phoenix and Phoenix Mesa Gateway Airport to celebrate the groundbreaking of a 50KSF expansion at its headquarters within Phoenix-Mesa Gateway Airport in Mesa. The expansion allows Able to enhance the technology used in its repair and overhaul process and to diversify into new product and service offerings. Willmeng Construction was the GC. 4. Lincoln Property Company has announced its completion of the $85M Lincoln Logistics 40 industrial project. It is the Valley’s first-ever delivery of a fully speculative 40′ clear height industrial project and represents more than 20 acres of Class A industrial space under one roof. 5. A newly opened 63KSF Safeway will anchor a new shopping center development called Ironwood, in Queen Creek at 40950 N. Ironwood Drive. It was developed by Brian Frakes and Common Bond Development. 6. Fellowship Square Surprise, Christian Care Companies’ sixth Fellowship Square campus in Arizona, 16477 West Bell Road, is celebrating with an official grand opening event on Thursday, January 24. 8. Central Christian Church will celebrate its new 40KSF worship facility at 22505 E. Ocotillo Road, Queen Creek, with a grand opening Dec. 15. The new church area provides seating for up to 750 members, a café and classroom spaces. 9. The Chandler Museum grand opening will take place Dec. 8. 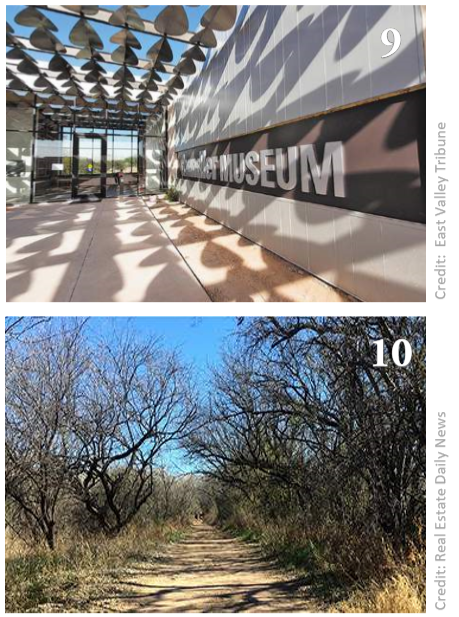 The existing museum has been closed while workers constructed a new 10KSF building north of the McCullough-Price House, south of West Frye Road and west of the Loop 101. 10. The Pima County Board of Supervisors on Dec. 4 unanimously accepted an agreement with the National Park Service certifying that the portion of the Juan Bautista de Anza National Historic Trail running through Pima County meets Park Service standards. The county began developing the trail following a bond approval in 1997.